The 2006 NBA draft, which was in New York City. The NBA draft happens every year in June. It is where teams in the National Basketball Association (NBA) choose players who have never played in the NBA before. If a team chooses a player, that player cannot sign a contract to play for any teams other than that team. Players must be at least 19 years old at some point during the year of the draft. If the player's 19th birthday will be the next year, they are too young. If a player is from the United States, it must be at least one year after the graduation of his high school class. Some players who are star players go to college and play college basketball for just one year (because they cannot enter the draft right out of high school), then enter the NBA draft. These players are called "one and dones". Other players enter the draft after two or three years in college, and other players are drafted after playing in college for all four years that they can. If a player has not played in college for four years, they must enter the NBA draft by declaring themselves eligible. Teams take turns choosing players. When a team chooses a player, it is called a pick. For example, if a player is chosen second, people will say that he was taken with the second pick in the draft. There are two rounds in the draft. Both rounds have 30 picks, so there are 60 picks in the whole draft. Each team gets one pick per round, but sometimes, a team will pick more than once in a round or not at all. This is because teams can trade draft picks for players, for money, or for other draft picks. The NBA allows teams who had worse records (which means that they won fewer games) the previous season get to pick before better teams. This lets bad teams draft good players and become better. The first fourteen teams to pick are the fourteen teams that did not make the playoffs the previous season. (There are thirty teams in the NBA, and sixteen teams qualify for the playoffs every year, so fourteen teams do not.) The teams that do make the playoffs and who get picks 15 through 30 in the first round pick in reverse order of how good their records were (so the best team gets the 30th pick, the second best team gets the 29th pick, and so on). However, the first fourteen picks are given out differently so that teams will not lose games on purpose to get higher picks. These picks are given to teams in a process called the draft lottery. Since 1985, all teams that have missed the playoffs have participated in a lottery system to see who gets the first pick. The lottery system has changed a few times since then, but the system that the NBA uses right now uses ping pong balls that have numbers written on them. A machine picks four balls at a time, and every possible combination of numbers is assigned to a team. Teams with worse records get more combinations of numbers, which means that they have a better chance to win. The machine picks three teams, and these teams get the first three picks in the draft. The other eleven teams will pick in order of how bad their records are, so the worst team that was not selected will pick fourth, and so on. Tim Duncan, the first pick in the 1997 NBA Draft. Many star NBA players who helped their teams a lot were selected early in the NBA Draft. For example, with the first pick in the 1997 NBA draft, the San Antonio Spurs chose Tim Duncan. Duncan would help the San Antonio Spurs win several NBA Championships. Other star players who were chosen with the first pick are Shaquille O'Neal (chosen by the Orlando Magic in 1992), Dwight Howard (chosen by the Magic in 2004), and LeBron James (chosen by the Cleveland Cavaliers in 2003. However, not all players who have been chosen with the first pick have gone on to become star players. Some players have not had as much success as the teams who drafted them expected, and have been called "draft busts". 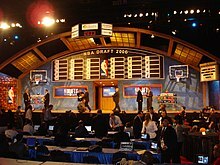 A few players chosen with the first pick who have been called "draft busts" include Joe Smith (chosen by the Los Angeles Clippers in 1995), Michael Olowokandi (chosen by the Clippers in 1998), and Kwame Brown (chosen by the Washington Wizards in 2001.) On the other hand, some very successful players have been chosen very late in the draft, and have been called "draft steals". One such player is Manu Ginóbili, Duncan's longtime teammate with the Spurs, who was chosen with the next-to-last pick in the 1999 draft. ↑ "ON THE ONE-YEAR PLAN / Does NBA's age restriction hurt integrity of college game? - Page 2 - SFGate". articles.sfgate.com. Retrieved May 6, 2010. ↑ "NBA.com: Evolution of the Draft and Lottery". nba.com. Retrieved May 5, 2010. ↑ "Blake Griffin the prize as NBA draft lottery celebrates 25 years - ESPN". sports.espn.go.com. Retrieved May 5, 2010. ↑ Dengate, Jeff. "NBA.com - Let the Ping-Pong Balls Fall". nba.com. Retrieved May 5, 2010. ↑ "Baller or Bust: NBA's No. 1 Overall Picks | Bleacher Report". bleacherreport.com. Retrieved February 3, 2011. ↑ "Biggest NBA draft busts of the last 25 years: Lottery Picks | No Guts, No Glory". ngngsports.com. Retrieved February 3, 2011. This page was last changed on 30 March 2019, at 01:25.